Protesters participate in the March for Our Lives rally March 24, 2018 in Washington, D.C. The National Park Service (NPS) is considering a number of changes related to events held on federal land in D.C., including potentially charging fees to hold demonstrations. NPS is considering charging for barricades and fencing, trash pickup, any damage to turf, event management and the setup and removal of structures, documents say. Under the current rules, the park service already has the authority to charge fees for "special use permit" events such as ceremonies and parades, but not for activities related to speech or expression protected by the First Amendment. The proposed regulations were drafted to protect national park land, NPS administrator Lisa Mendelson-Ielmini said. "We have a great opportunity to improve the ways we make these special places accessible while preserving them for future generations," she said in a statement. There are nearly 300 small and tiny parks throughout the District and maintaining them takes a lot of resources. News4's Tom Sherwood reports The National Park Service is trying to figure out what to do with the parks. NPS also is considering changing rules on the number of people that can take part in demonstrations without permits in some locations. In McPherson Square and Franklin Square in downtown D.C., for example, 500 people can demonstrate without a permit. That number could be either raised or lowered. NPS also proposed requiring a permit for organizers of an event or demonstration who put up any structure larger than a speaker's platform or lectern. Without a permit, event organizers can damage turf or marble, and fail to ensure a structure is safe, NPS says. Additionally, the rules would bar demonstrations and special events from taking place at the Martin Luther King, Jr. Memorial, the World War II Memorial and the Korean War Veterans Memorial. 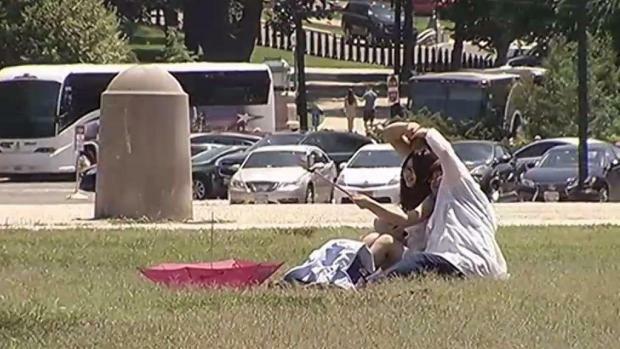 Similar restrictions already are in place at the Lincoln Memorial, the Thomas Jefferson Memorial, the Washington Monument and the Vietnam Veterans Memorial, NPS says. The goal is to "help maintain an appropriate atmosphere of calm, tranquility, and reverence in these memorial areas," the proposal says. Starting Wednesday, NPS is accepting public comments on the proposed rule changes. Go here to read the full proposal and see how to make your voice heard.